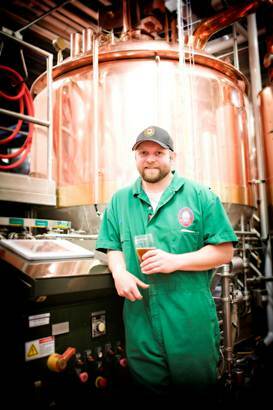 Cam (pictured below in the brewhouse) was the first brewer at the Portland pub when it opened in 2009, has been responsible for crafting many of the exclusive experimental beers served there. He has also worked on labors of love like Hop in the Dark, which wasn’t released formally until it had gone through 22 rounds of tinkering. He joined the company in 2004 after spending a couple of years with Sierra Nevada Brewing Company. 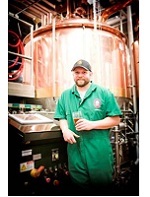 Cam holds a bachelor of arts in biology with a minor in chemistry, and has completed the University of California Davis Master Brewer Program.Brian (pictured below with hop bales) has been with Deschutes Brewery for five years and worked in various roles in the brewing department, most recently as assistant brewmaster for production technology. With a background in computer science and software development, Brian brings this precision to the brewhouse - optimizing recipes and developing operating procedures. 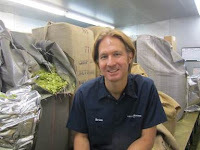 He holds a bachelor of science in computer science and has also completed the University of California Davis Master Brewer Program. Both Brian and Cam have played critical roles for the past several years in the ongoing success and growth of Deschutes Brewery. In their new roles as brewmasters, they will continue to help guide the development of the company’s future.